New Birmingham City manager Lee Clark has promised Blues fans that his team will maintain Chris Hughton's attack-minded legacy next season. Hughton's side hit 78 league goals last term, Blues' highest tally in 17 years, to make the Championship play-offs. And Clark told BBC WM: "I want to get the fans excited too and get them on the edge of their seats. "I need the same commitment and attitude they showed last season. If they do that, we'll all be happy." It is hardly a surprise that a man who learned his trade at Newcastle United in their great days under Kevin Keegan should have inherited his flair for attacking football. 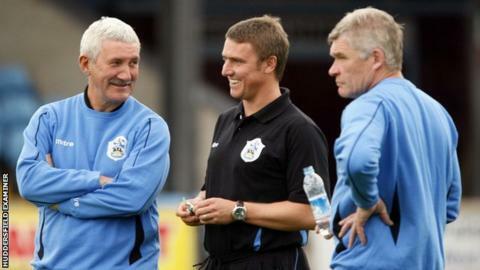 And, with another of Keegan's right-hand men, Terry McDermott, by his side (as well as the defensive contribution of Derek Fazackerley), that was certainly what Clark prioritised in his first managerial role at Huddersfield. "In my first full season, we hit 82 goals and were the third highest scorers in the league behind Norwich and Southampton," recalls Clark. "In my second full season, we got 77 and finished fourth highest. "And, when I got sacked last season, we were the highest scorers in the league." Blues' league tally last term was the highest since Barry Fry's side hit 84 in 1994/95. But, after signing a similar rolling contract to his predecessor Hughton, Clark remains undaunted. "I'm 100% determined to carry on what Chris Hughton has done," he insists. "My record backs that up. "I like my teams to get the ball down, play high-tempo football and make a lot of chances for strikers to make a name for themselves." Lee Clark's backroom team . . .
Scouser Terry McDermott won the 1980 PFA player's player of the year award and the football writers' player of the year award double in 1980. He claimed the BBC's Goal Of The Season for his chip, against Everton in the 1977 FA Cup semi-final and took ITV's Golden Goal two seasons later with a stunning header in a 7-0 win over Spurs. The midfielder, who started at Bury and had two spells as a player at Newcastle either side of his eight years at Anfield has a career haul of over 100 goals. Preston-born Derek Fazackerley made over 700 appearances in an 18-year career at the heart of the Blackburn Rovers defence, scoring 23 goals. He then saw out his career with short spells at Chester City (where he scored a vital cup goal against local rivals Wrexham), York City and Bury. Given his goal-heavy track record, and the fact that Clark's Terriers were fourth in League One when he was dismissed in February, he admits that his sacking came as shock. "Of course," he said. "But it's water under the bridge. It's gone now and I've been given a fresh challenge here of coming to a fantastic club to try to get them back into the Premier League. "Huddersfield have had their success and I'm delighted for them as there's a lot of good people there. "But what's done is done, I've moved on and I'm really excited about the future." And he is even happier about taking on the challenge at St Andrew's with two reliable henchmen by his side in McDermott and fellow 60-year-old Fazackerley. "Obviously, Terry McDermott has got a huge amount of experience," added Clark. "He was a European Cup and league winner on numerous occasions with Liverpool. "And, on the management side, he worked alongside Kevin Keegan, Sam Allardyce, Graeme Souness and Kenny Dalglish. "And Derek Fazackerley is a first-team coach, who also has massive experience in the Premier League and in the Championship and internationally alongside Kevin Keegan and Sven Goran Eriksson." "And I like to think they complement myself being more of a younger manager."